President Donald Trump soon will meet Russia’s Vladimir Putin in Helsinki, Finland. President Trump long sought this summit and talking is better than silence. However, without a change in U.S. policy it isn’t clear what positives will result. Much of Washington has fixated on the Russian. Democrats treat the White House as Russian-occupied territory. Republicans see Putin as a leader of the global resistance to American dominance. The president should approach the summit with a realistic assessment of Moscow’s capabilities and intentions. Putin is no friend of Western-style liberalism, but then, many U.S. allies are no less authoritarian. Nothing suggests plans for aggression against Europe (or America!). And the Europeans don’t believe so either: even the countries squealing for U.S. troops spend barely two percent of GDP on their militaries, ludicrous levels if they really fear attack. Moscow no longer is a superpower, but remains capable of asserting itself, as evidenced by its confrontational policy toward Georgia and Ukraine. Washington and Moscow need to work through the issues which most sharply divide them. Since Putin is unlikely to admit to interfering with America’s election, the two presidents should agree to stay out of each other’s internal affairs. In fact, the U.S. is a more active meddler than Russia—Washington has intervened in at least 81 elections worldwide, including the 1996 Russian contest. Submitted by email_registrat... on Thu, 07/12/2018 - 11:31. This article is well thought out, and hopefully the President sees it. 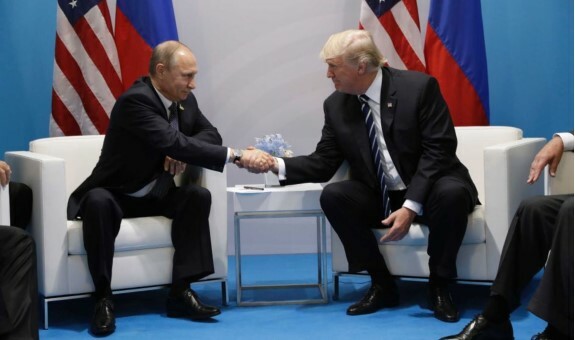 All the Democrats can repeat is Russian collusion, when, in fact, President Trump has been more aggressive toward Russia, especially in Syria, than the former administration. He takes no prisoners. Obama only had a red line...they crossed the red line and Trump pounded them twice, to the chagrin of Russia.